Let's be clear, our goal is to produce a clear, clean liquid which will enrich and enhance anything that it is added to, without imposing a flavour of its own. It should not be good enough to consume by itself. I use nothing more than the cook's "holy trinity" of roughly chopped onion, carrot and celery, also known as a mirepoix which provide pleasing sweet middle tones. You can substitute half the quantity of onion with leek. The only aromatic we will use is parsley and I use just the stalks for flavour. The proportions: one part vegetables to 10 parts water. You cannot produce a clear and clean stock without skimming the impurities that will rise to the surface. If you don't remove this scum it will simply boil and emulsify adding it's "flavour" to your stock, this makes it nigh on impossible to achieve a clear liquid, no matter how much you filter it. Salt. Cooks to not add salt to stock. We wait to flavour the end dish, not this one. Measures available: Metric Imperial U.S.
Place the 2.5 litres of fresh cold water into a stockpot. Add the vegetables to the water along with the parsley stems and peppercorns. Place over a medium-high heat and slowly bring to a boil. Have a skimmer handy as more and more impurities will float to the surface as the water reaches boiling point. Just before the water reaches boiling point, lower the heat and simmer the stock for 30-40 minutes. 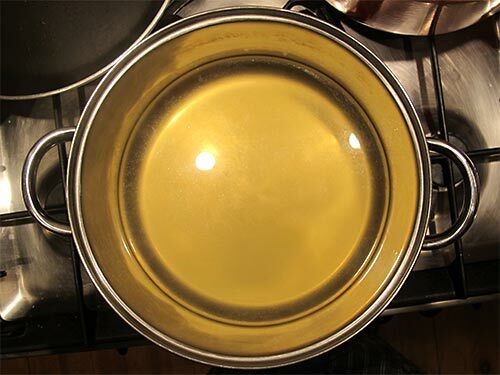 Strain the stock, then place in a bowl of cold water to cool quickly. For a really colourless stock substitute parsnip for carrot.